Art fulfills many a need of the human soul and psyche. For some, it’s a way to express the visceral feelings one has about society, nature, and emotions. For many, it’s a necessary escape from those same things. A need for artistic expression is almost as ingrained within humanity as the need find food, water, and shelter. However, the most important part of any art form, whether it be literature, paintings, photographs, music, or poetry, is not the physical piece of art itself. The most important piece of every art form created by humanity is the sense of community it brings to those who enjoy it. I’ve been to many a concert and festival in my life thus far, but there hasn’t been one that quite drove this point home like the Redwood Metal Fest in Ukiah this year. The masterful organizational duo of Bryon and Jacob was a wonder to behold. Self described as the “people” and the “stuff”, respectively, these two wandered the park keeping everything running smoothly without a single bit of shown effort. Goofy metal nerds they may be, but they were some of the most professional, fun loving, and down to earth people I have ever had the pleasure to meet. With an obvious passion for what they do, it’s surprising that they both aren’t involved in something more massive. However given the turnout of the festival this year (which exceeded last year’s total by 3pm), they definitely aren’t far off from having something as large or notable as Aftershock or, Warped Tour, or Knotfest. They’ve found a formula for something that Mendocino County and the greater NorCal area have been craving for ages. Honestly, there’s still only up to go from here. Now, the festivals I mentioned just a second ago do have one difference, (maybe a couple more) in that they get major national acts and draw tens of thousands of people. Yet, they didn’t just start out drawing huge bands like Slipknot or crowds of 60,000 people. Most major annual festivals started much like this one, a big dream of small folks who want a place for the music they love and the people they want to hang out with to synergize in the most wonderful way. Bryon and Jacob have the will, determination and the ability to make that sort of festival accessible to the Northern California area. 300-400 people in one year could easily be over 1,000 the next, and so on. What about the bands?! Perfect question, because what is a quality music festival without quality music? Absolute garbage obviously, but that was far from the case in Ukiah this year. Of the 16 bands of the various subgenres of metal and punk and that played that day, there were almost no artists that I couldn’t imagine being on a stage at a major show. Despite the stigma that comes with being a metalhead or metal artist, (a stigma which is rightfully shrinking with each passing day, I might add) the genre remains one of the most passionate, soulful, and just plain real forms of artistic expression that exists. Yet, that passion and sense of soul doesn’t just reside with the artists. It resides within the core being of every single person who enjoys this music as well. Ukiah especially proved to me that metal is unifying in every possible way. Young, old, man, woman, black, white, rhino, purple people eater, flying spaghetti monster, none of these superficial descriptions that we hear all the time mattered to a single person who was there that day. We were humans. Humans collectively enjoying an art that meant more than just dissonant riffs, brutal drum beats, and non-melodic vocal styles. Not a single person got into a fight, the language from the stage stayed clean, and the only time the an authority was involved was when a sheriff pulled off the road to rock out for a few minutes before returning to his daily grind. Good food, great beer, fantastic music, and the best sides of all people coming to the surface. Truly, this festival was living proof that humans can just be peace loving beings enjoying the better parts of life. 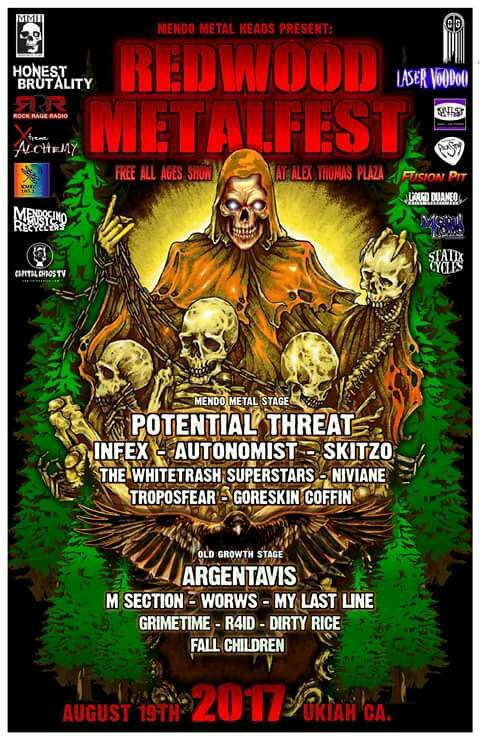 Redwood Metal Fest is a shining example of all that a music festival is meant to be. In this trying and divisive climate of reality, it’s refreshing to know that we can still just hang out in a park and focus on what really matters. Love of art, love of self, and love of others. I personally can’t thank Bryon, Jacob, and all the others involved in allowing myself and the rest of Honest Brutality to be a part of something so beautiful and harmonious. I can’t wait to see what the Mendo Metal Heads have in store for next year.